This stunning wooden shield has a design that is inspired by the Viking and Norse shields of old. 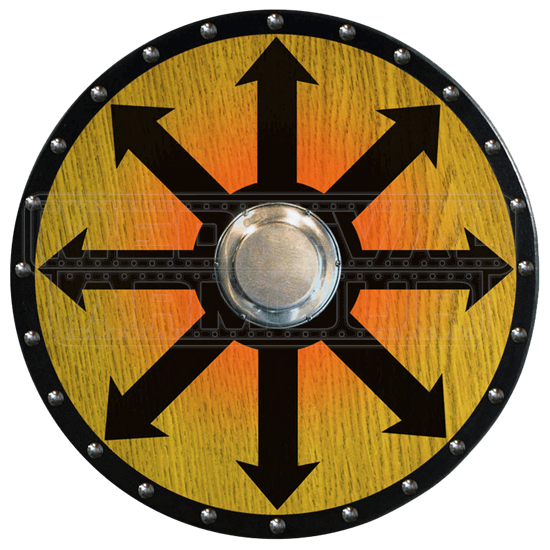 The Wooden Viking Berserker Shield (Chaos Arrows) is hand-crafted from quality materials, making the shield not just striking but also fully functional. The center of this shield features a heavy metal boss that is flat and somewhat disc-like in shape. Expanding out from this boss on the wood of the shield is a design known as the chaos arrows or the chaos star, which depicts eight arrows all expanding out from a central point or circle. The background of the center of the shield also features a fading orange sunburst design, which helps to give the shield depth and visual appeal. The border is black and is lined with stainless steel studs. The shield measures approximately 25 inches in diameter and, when worn, reaches far enough to cover the arm past the elbow and provide more than adequate protection. The shield is also extremely well-balanced and will serve well either on the field of battle or as a decorative wall-piece. It is made from 0.5 inch thick plywood. As the wood-grain is visible against the background of the shield, please note that the shield you receive may look slightly different from the one pictured above, as no two wood-grains are exactly alike. Dual leather straps are featured on the back of the shield and allow the shield to be carried and used easily. One strap wraps around the forearm while the other is gripped securely by the hand. The painted front of the shield has also had several coats of topcoat varnish applied to it, in order to offer additional protection against any wear or tear the shield may experience. 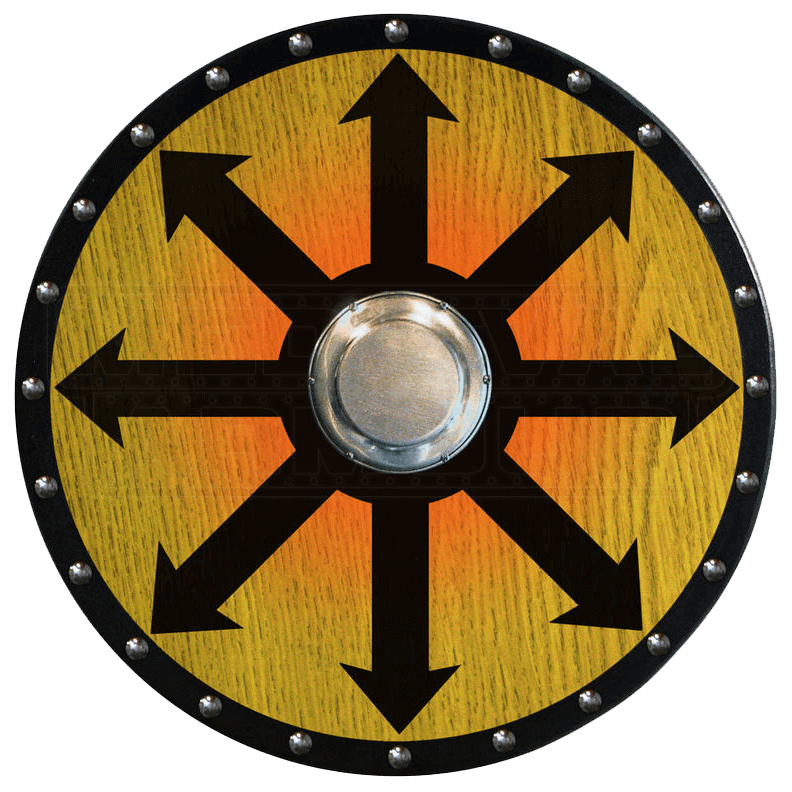 With its classic style and intriguing design, the Wooden Viking Berserker Shield (Chaos Star) is the perfect shield for any Viking to wear to his or her local Renaissance Fair or to practice with while preparing for a large-scale battle.